Photo: Arthur Orchard – keep an eye out for this promotional gem! Waterfall Bay is perhaps one of Eaglehawk Neck’s best kept secrets! The small innocuous sign two kilometres along Blowhole Road simply reads as above – hardly a compelling reason to explore. Blink and you will miss it! 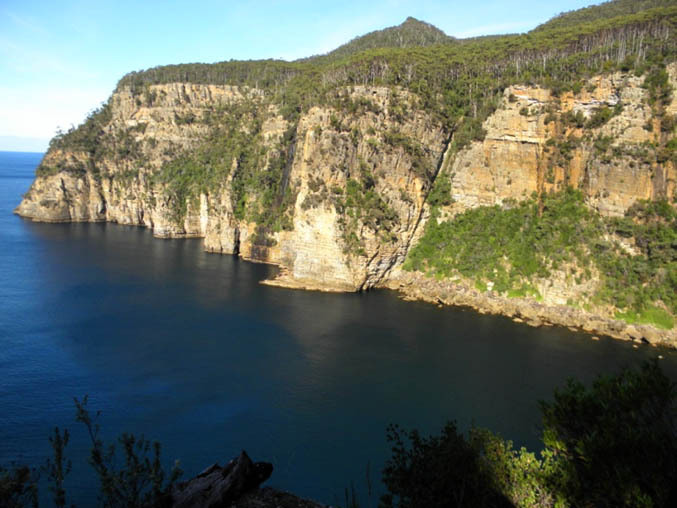 It is well worth the seven kilometre drive to the Waterfall Bay Lookout, although the road itself is not sealed. Much of the drive is through The Tasman National Park, featuring soaring Eucalypt and Blackwood forests growing close up to either side of the narrow road. A magnificent sight! At the end of the road there is a good-sized car park, with visitor lookouts nearby that seem to cling tenuously to the edge of the cliffs, revealing breath-taking views to the ocean far below and the beautiful waterfall that (usually) cascades several hundred metres down the cliffs opposite into Waterfall Bay. Photo: Arthur Orchard – the fabulous view from Waterfall Bay lookout, on a calm day. Note falls centre-left. 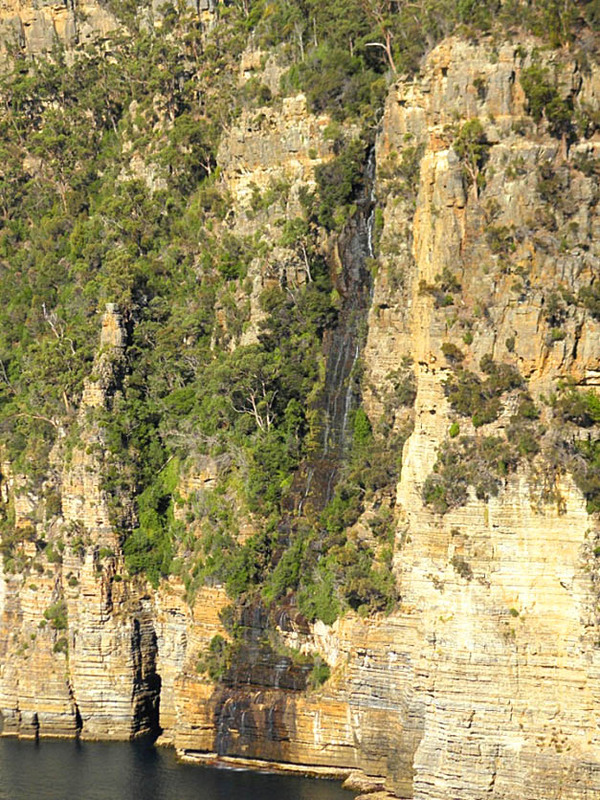 Pennicott’s cruise boats can sometimes be seen far below on their three hour adventure from Pirates Bay to Stewart’s Bay near Port Arthur, via Tasman Island. To the delight of all on board, one of the highlights of this trip is to experience the boat nudging right up to the cliff face at the base of the waterfall. Photo: Arthur Orchard – Waterfall Bay Falls after just a little rain. Abalone divers and other commercial and recreational fishermen can also be seen on occasion; in close to the majestic cliffs or heading offshore toward The Hippolyte Rock protruding from the ocean in solitude several kilometres out to sea. Unfortunately the road access to Waterfall Bay is under a cloud as there are tentative plans to close Waterfall Bay Road once a new car park and related facilities are installed near the Tasman’s Arch and Devil’s Kitchen. Access to the lookout would then be via a coastal walking track, an hour and a half round trip. Whilst the walking track provides a wonderful experience, with amazing views from the well placed viewing platforms along the route; most visitors are short on time and the track is not suitable for the elderly, disabled or young children. To deny these groups access to this iconic location simply because of the cost of maintaining Waterfall Bay Road would appear to be discriminatory. The local community is committed to having Waterfall Bay kept open to the public and properly maintained. Visitors can assist by ‘Liking’ their experience, send us your Comments or sign the e-Petition below.